Bali has a unique style of food. I am a chef. 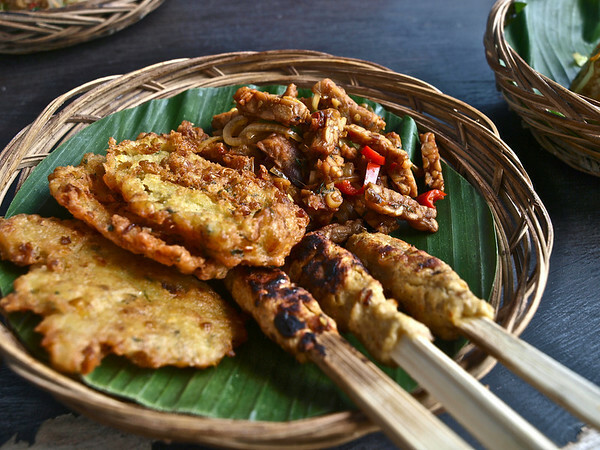 Bali has many great restaurants serving unique, fresh and flavorful dishes. Many of these establishments and their chefs offer cooking classes. I recently signed up for Alit’s Warung Cooking Class which is run by Alit. A warung is a small family owned business, usually a cafe, an essential part of daily life in Indonesia. The cost of this half day cooking class was 250,000 rupiah or about US$26.00. This was by far the least I had ever paid for any cooking class in the states. 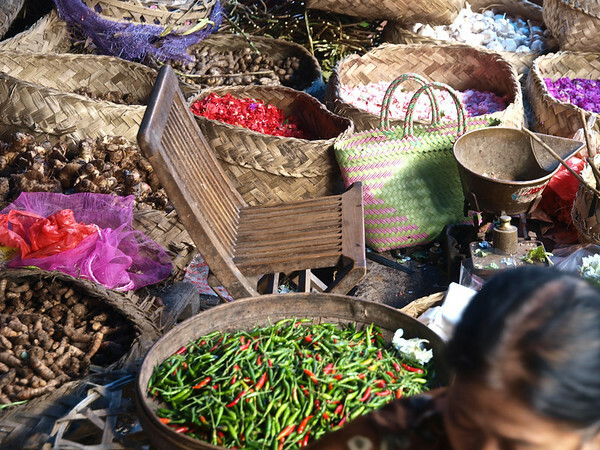 We met (not too) early in the morning and we proceeded to the Ubud Central Market where we learned how to pick out the best spices (this was worth the price alone). Like any good chef, Alit had her favored vendors and we skillfully eased through the crowded market as we continued to pick out white and black peppercorns, candle nut, nutmegs, garlic cloves, jumbo cinnamon sticks and other ‘exotic’ ingredients. 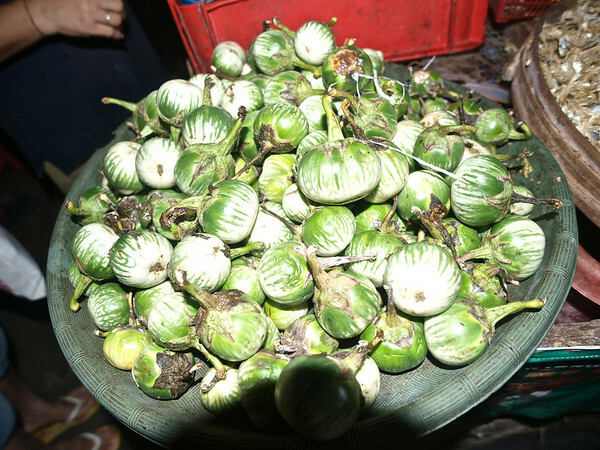 Along the way, Alit identified some of the fruits and vegetables unique to the region such as both white and green eggplant and jack fruit. 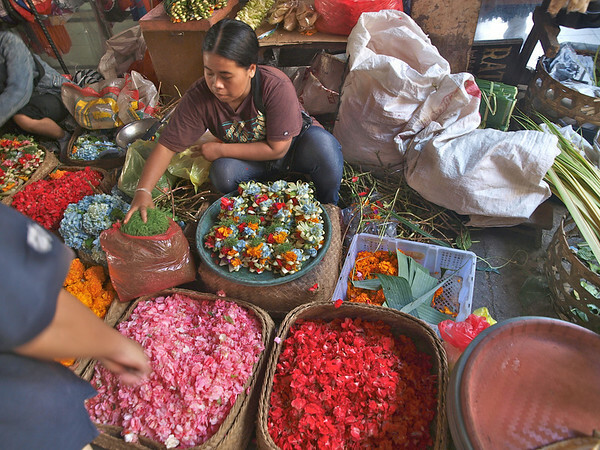 Fresh flower petals are also sold in great abundance. We needed some for garnish but mostly the two large bags we filled were to be used for the daily offerings which are an essential part of Balinese spiritual life. 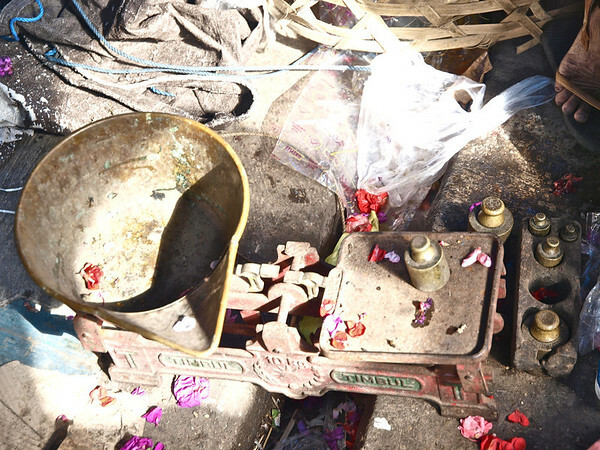 We arrived back at the warung to find a typical outdoor Balinese kitchen set in a beautiful garden setting. 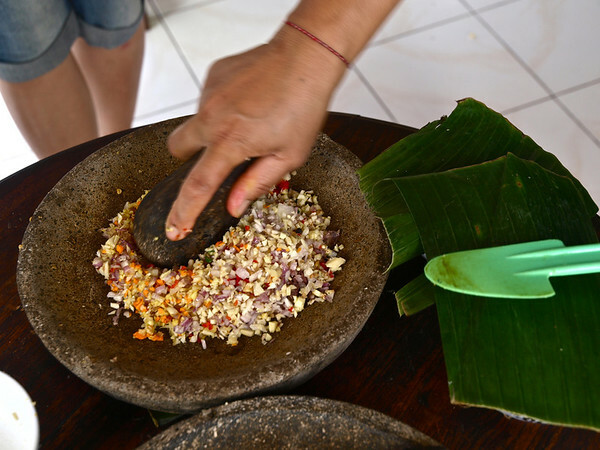 The first task for the four students was to grind the spices for Balinese Sauce. This is done in classic large stone mortars and pestles. We were shown the proper technique of dragging the pestle through the mortar. This is time consuming and a good workout for the wrists. Being fairly tall, I am not used to working on such a low prep area either as you can see. Nonetheless, I was having great fun learning new techniques and working with new ingredients. 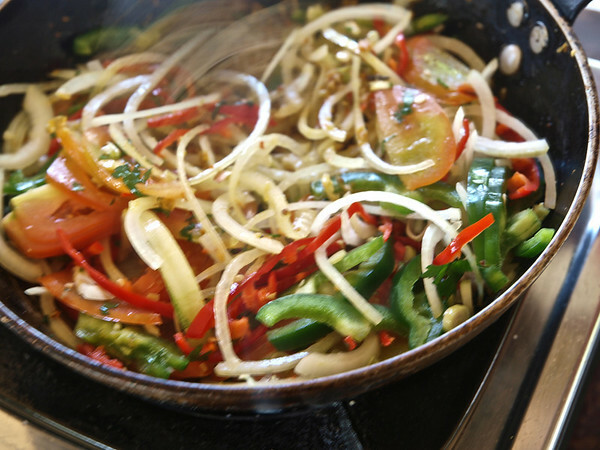 Once the spices are pulverized, they are fried in coconut oil for two minutes then the sauce is set aside. 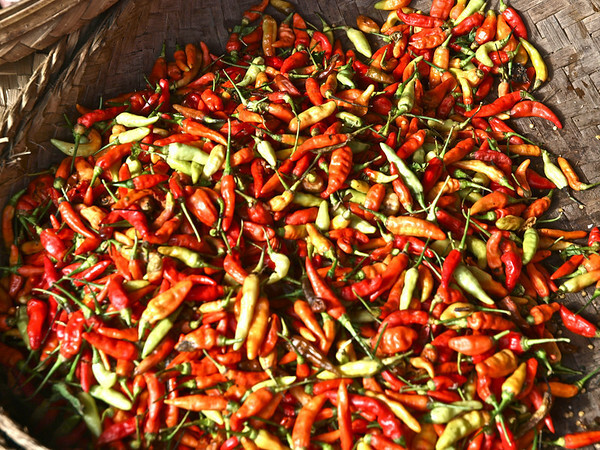 It will be used in several of the dishes. Each dish has many ingredients. Despite its apparent simplicity, the methods used are very exacting. Well eventually all the dishes were cooked. And then four students became four customers as we were served out lunch by Alit’s lovely assistant in the garden. We received a complete list of the recipes following lunch. I would recommend this class to anyone wishing to broaden their culinary horizons. I will be taking more cooking classes in Bali for sure! Here are a few more photos from my morning class. WHAT? A CALIFORNIA REDWOOD FOREST IN NEW ZEALAND? I just took a cooking class in Barcelona and vowed to take one in every country I visit. It looks like you created a wonderful meal!! What a great idea Annette. Did you make paella by chance? I definitely want to master a few Balinese recipes while I am here. Looks like you’re having a wonderful tie in Bali- did you find a great place to stay? ‘Great to hear you are enjoying the food in Bali! If it’s at all possible, go down to Wayan’s on Monkey Forest Rd (Ubud) and eat. There is a strong Santa Cruz connection with Wayan’s too. Very good food, well presented, and a beautiful settig too. Yes the food is awesome here. Thanks for the tip Bob and Vivian. I’ll be back in SC area around July 15, for 2 or 3 months. Mon pleasure and bon appetite Karen. I will be taking more classes for sure. Love that they use so many fresh ingredients. Fresh everything, especially the spices and vegetables. And remember how good all the tree ripened fruit was in Central America? It’s the same here. I start each morning at my homestay with a super ripe assortment of papaya, mango, banana, pineapple…. Looks like a fun time and the food looks so fresh and delicious! Hope to learn some great tips and share a meal w/ you when you get back!! Here ya go: Alit’s Warung, Beji Lane, 50m from Monkey Forest Road. Phones: 081-239-559-03 and 081-337-998-332. Call a day before (or more) to book. They wil pick you up at your hotel or homestay and take you to the class in the morning (possibly on the back of a scooter). Such a great post ! I also love Balinese food, I even have a facebook page full of food pictures from Bali. Thanks DebbZie. I am enjoying your photos. Oh – we so like a lot of the same things Phillip.. we also did cooking class in Bali and loved it. Thanks Joanne. This was a very good class. I would love to go back and take a couple more…probably will!